Tongue-tie (ankyloglossia) is a congenital anomaly which may decrease movement of the tip of the tongue. 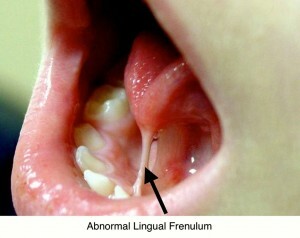 It is caused by an unusually short, thick lingual frenulum, a membrane connecting the underside of the tongue to the floor of the mouth and is repaired by a frenulotomy. Frenulotomy is one of the many ear, nose, and throat conditions treated by the specialists at Fort Worth ENT. Surgery to repair tongue-tie usually consists of snipping the frenulum (frenotomy) or surgical revision of the frenum (frenectomy, frenulectomy, or frenuloplasty). Or a protruding lower jaw. If your child has been born with tongue-tie, it’s important to contact your ENT specialists to discuss your options.